There is a Swahili saying that says, “Ndo Ndo Ndo, Si Chururu.” The saying can be translated into English as, “Drip Drip, Fills the Bucket.” That is exactly what has happened at KELI. KELI started two years ago with 25 students in the backroom of my mom’s house. 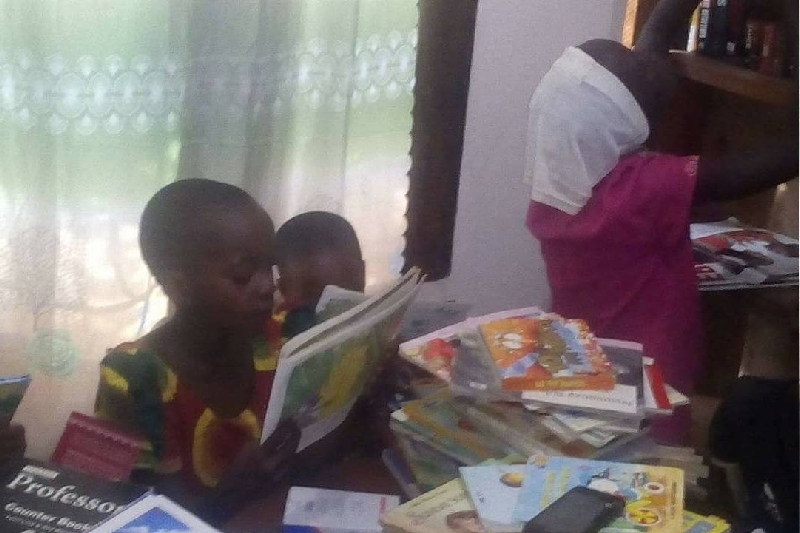 It was a simple gesture to help kids in my community get a library stocked with reading and technological resources aimed at bridging instructional and technological gap that exists between rural and urban schools in Tanzania. It was a small project. I had no idea how important it would be? Or, how useful it would become? Since KELI’s opening in January of 2016, the project has reached over 1000 kids in its after-school academic enrichment programs, in the tutorial help for math, English and computer skills development program, and through its experiential learning field trips to various businesses and government organization in the area. The experiences have been truly wonderful and positive for the children. Because of the successes we have had. The demand for the program has increased exponentially. The center became too small to accommodate all the children interested in our programming. Thus, I made a decision to grow, increase space and capacity to accommodate a greater number of children in the community. In November of 2017, KELI’s expansion started. At the moment, thanks to our generous supporters such as yourself, we have been able to complete two classrooms, a toilet, and a teachers’ office. By understanding the role play, plays in learning, KELI wishes to construct a state of the art playground at the center. We hope you will partner with us to make this dream of ours a reality. We currently need $1500 to have the playground constructed and installed. We hope you will support our vision by donating to this cause. So far, we have raised $350 on Facebook and $55 on GoFundMe page. Below are some pictures showing the progress we have made constructing the main building (two classrooms and teachers office) and toilets. We hope you will be so kind to help us reach the $1500 goal for a playground. Analyzing Mv. Spice Islander’s Investigation Report in Light of the Mv. Nyerere Ferry Sinking in Mwanza Region of Tanzania. According to the report, “MV Spice Islander” had a maximum human loading capacity of 600 passengers. However, at the time of its sinking, it was carrying 2470 passengers. That is four times the maximum allowed. Further reports says, 941 passengers survived, 203 passengers lost their lives and 1326 passengers are still missing. I’m saddened by the magnitude of human loss. The report further states, the cause of the accident was “severe levels of negligence.” Nine (9) people have been arraigned in connection to the accident. The dead and survivors of this accident will be compensated at a rate of Tshs 125,000 for 80 months which is equivalent to Tshs 10,000,000 per person. The suggested figure is what I have issues with. I feel like the figures are too low and will not work as a deterrent for future man-made accidents. My understanding is that human life is priceless. To save it, stiffer penalties must be imposed as a deterrent. Why payments are based on the basic salary levels? What made the commission to assume that all these people were going to die in the next 6 years and a half (80 months)? Why not use established income earning potentials for each of the passengers and life expectancy figures to figure out the payment? This was an opportunity to severely punish those involved so that it will be a lesson to them and for others currently benefiting from this kind of behavior. Don’t let this incident be another missed opportunity like MV Bukoba. This should be a wake up call to shipowners, bus owners, and everyone involved in the transportation business. They needs to understand that “if you cause an accident due to negligence” leading to a loss or loss of lives; severe consequences will follow. The “kazi ya mungu” excuse should not be be the norm. Once a person purchase a ticket, it’s a contractual agreement between the two parties and that the latter will transport the former safely from point A to point B. These contracts need to be honored. Maybe in the future (“that means now”) the government could implement a system that forces bus, ship and any kind of transportation business owners to declare the insurance value of a passenger and luggage on the back of the ticket in case an accident happens. My belief is that if the owners are subjected to stiff penalties whenever accidents happens and are starting to see that their profits are being eroded; they will make sure that accidents due to negligence will not be a daily occurrences in Tanzania. To make them change their minds and put safety measures before profit, you have to hit them where it matters most—profits. In addition to a deterrence on the part of the ship, buses, and any-other type of transportation owners. Citizen awareness campaign regarding overcrowding in public transportation needs to be carried out. It seems people are not learning from these incidence. More campaigns on road safety and problems associated with overcrowding are severely needed. Kibogoji Experiential Learning, Inc (KELI) is registered Not For Profit Organization in Tanzania. Its mission is to bridge technological and instructional quality gap between urban and rural students of all levels in Tanzania. The project is organized in support of our pre-school and after school education enrichment programs. Kibogoji Experiential Learning, Inc (KELI) promotes early childhood education and Universal Primary Education. The increase in enrollment has increased the load to our staff and other workers to deliver quality services to the children. We currently serve a population of more than 100 children with only three teachers. Volunteers are needed for teaching, training teachers, and in our outreach programs. We hope our volunteer will also help in fundraising and grant writing to secure more funding. Therefore, if you have passion for children, have worked in fundraising and are a successful grant writer, we welcome you at KELI. Improving school learning environment and quality education. 1 to 12 months. The program is running throughout the year with vacation breaks in June and December. Kibogoji Experiential Learning, Inc (KELI) will provide accommodation for the duration of your stay. You will be given separate living quarter with own private entry. There is shared fridge, microwave, flat tv, and a range oven (GAS AND ELECTRIC COMBO). Turiani, Mvomero District, in Morogoro Region. 5 – 19 years old. The extra fee is intended to support the local host. It is due upon arrival. Should children be the most important thing in your family? I was having difficulties reading it from the photo so I re-posted it as a comment. It’s worth the read. Last year I opened up a one roomed after school program for kids in a small town I grew up in in Tanzania. Kibogoji Experiential Learning Center is an innovative education center that seek to bridge instructional and technology gap between rural and urban schools in Tanzania. The main focus of the center is to improve early childhood access and after School enrichment programs for primary school aged students. The center opened its doors in January 2017 with 25 students in a one roomed classroom. However, due to high demand for our early childhood and after school enrichment education programs, we currently have 120 registered students. Thus, our one roomed classroom space is very limited and we would like to expand soonest to reach more kids. $3200 to finish constructing our new two classroom building with a teachers’ office. $1200 to construct bathrooms. $2500 to create child friendly environment for the students including swings, slides, and a field for sports. $650 for chairs and desks for the two classrooms. Your donation is highly appreciated and we thank you for your support. At Kibogoji Experiential Learning Center we live our lives believing that, “it is easier to build strong children than repairing broken men.” We hope you will support us in this endevour. Kibogoji Experiential Learning Center, Inc., Turiani, Tanzania. 1,132 likes · 1,243 talking about this. Kibogoji Experiential Learning Center, Inc.
Shaaban K Fundi, M.S., M.A., Ph.D.